Designated as UNS K91560, the T91/ P91 steel is a 9Cr-1Mo ferritic alloy steel with deliberate addition of vanadium and niobium, as well as controlled nitrogen content. It has outstanding heat-resistance and creep strength. It also has good resistance to corrosion, oxidation and fatigue rupture at elevated temperatures. The T91/ P91 steel is primarily used for superheater and reheater in power plant boiler construction, headers, main steam pipeline, as well as the heating furnace piping in petrochemical industry. 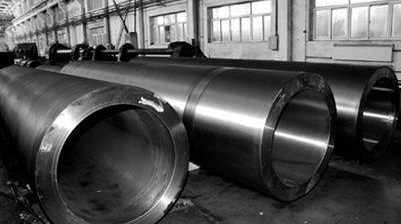 Compared to other austenitic alloy steels, it has better thermal conductivity and thermal expansivity. ASTM A335 P91 seamless pipes I.D=508 mm, W.T=66 mm. *The ASTM & ASME corresponding standards: i.e. ASTM A335 P91 & ASME SA335 P91, ASTM A213 T91 & ASME SA213 T91. *V:0.18-0.25, N:0.030-0.070, Ni:≤0.040, Al:≤0.020, Cb:0.06-0.10, Ti:≤0.01, Zr:≤0.01. *The tensile test shall be conducted at room temperature. *It is 2″ specimen for the test; the elongation shall be longitudinally tested. *The typical physical properties at different temperatures.